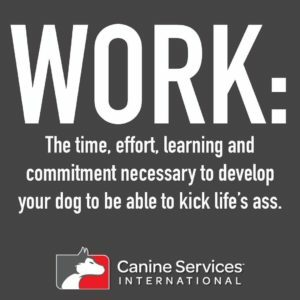 Home / Canine Services International Dog Training Blog / Do the work or don’t do the work. You don’t need anyone to tell you whether you hit the mark with your dogs training – you know inside, deep down. You know when you see your dog fearful of new things, sounds, surfaces. You know when he goes crazy at another dog on your walk…after dragging you down the street for the last 500m. You know when he can’t be out during a small gathering at your house because you have no influence over his behaviour. You know when you take him to the dog park and he doesn’t come back until the 5th, 10th, 20th time you call him. You know when you pass a well behaved dog in the street and catch yourself wondering if that owner would be willing to swap dogs with you for a night. You know when your constant excuse for his poor behaviour is “he’s a rescue”. You know when your friends comment on how well behaved your dog is, and you joke that you’ve never trained him…because you know one day that very loose thread may just unravel. You know, in many ways, and you’re reminded of it daily. Do the work, or don’t do the work. If you don’t do the work, don’t tell yourself or your friends about your hard luck story if your dog develops bad habits, anti-social attitudes or problem patterns of behaviour: after all, you took the gamble and it didn’t work out. When you get sick of making excuses for your dog, and for yourself, we’ll be here to help as best we can. If you want to avoid that, then best make sure the work gets done.